Five years ago our school district moved away from the traditional growth plans and asked schools to pursue inquiry based learning at each site. Our work gets posted on the web and is shared with our parents at our PAC and SPC meetings, but I decided to also share our learning through this medium to increase access and hopefully stimulate some discussion around the learning at our school. What impact will collaborative time within the school day have on teacher professional development? In the Spring of 2013 two teachers (Carol Barton and Anita Berekoff) attended the BCTF Inquiry Leader training in Kelowna. Between their training and travelling back and forth to Kelowna they realized there was some ways to embed the process of inquiry into our school day. They came to me with a plan of adding time to our day and using the extra instructional minutes to release teachers for 6 afternoons of inquiry. After discussing their proposal as a staff I presented to parents and the Board and we were approved for a pilot project for 2013-2014. Seeing as it was a pilot and our first experience in school wide inquiry, I wanted the focus of the teachers to be on the process itself. I wanted them to choose topics that were of interest to them and were pertinent in the context of their classrooms. I wanted teachers to have choice and feel empowered in their own learning. Our 6 Inquiry days were set in the Spring of 2013. Each with a different focus, but would follow the process of inquiry. Our “investigation” or professional learning would change each time, but the structure of our meetings times would remain consistent. Our sessions were facilitated by Anita and Carol. Session #1 – August 30th. 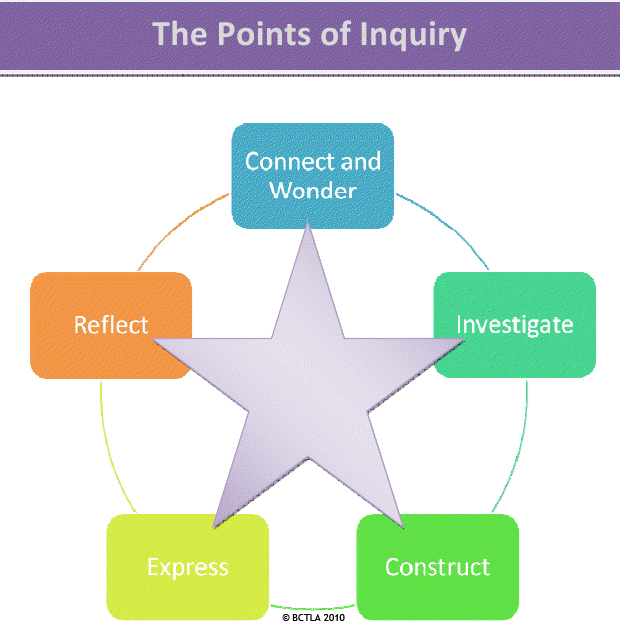 We reviewed the process of inquiry (see diagram) and people began to think about the type of question(s) they would be asking. We also brainstormed a list of “Group Norms” that we all agreed to. People were tasked with bringing a draft question to the next session. Session #2 – September 18th. We discussed and shared successes and frustrations to date. We also shared the first draft of our questions and looked for common areas of interest within the group. People were encouraged to find similarities in others work and partners to collaborate with. People were tasked at collecting some data around their question for the next session. Session #3 – October 30th. Once again people shared and successes and struggles. We were tasked at analyzing our data and making plans for further inquiry. We began to focus on the “construct – express – reflect” aspects of the process. Session #4 and #5 – December 4th & January 29th. We started as we always do with some reflection time where we shared some of our successes and struggles. People were introduced to the “tuning protocol”. The protocol is a very structured and collaborative way to discuss progress to date. Group members were tasked with asking probing questions and challenge the thinking of people in their group. People looked at their data with a critical eye and planned the next steps in their learning. 5. Session #6 – April 9th. Share successes and struggles. We spent a bulk of the time preparing presentations for the May 14th celebration. 6. Session #7 – May 14 – Celebration. At our celebration people were asked to share their learning and their thoughts on the process. STRUCTURES AND STRATEGIES: What did it look like? Within our inquiry people pursued a number of different types of questions. Half of the teachers pursued questions specifically around implementing the MindUp curriculum. This curriculum is focused on learning about our brains, how they work and teaching them how to be metacognitive. Students are encouraged to use this to help them ready their brain to learn. Learning to self-regulate is important for all students, not just those who struggle. We also had teachers who focused on our vulnerable learners. Our Learning Support team looked at different models of delivery. Knowing that resources are becoming more and more scarce, they looked at more efficient and effective ways of supporting kids who are struggling with their learning. One teacher changed her question part way through the year when she realized she had some kids who were not connecting with their classmates and the school. She was willing to look at the structures in her class in an attempt to make it a more welcoming and accepting environment. All in all the focus on professional learning and implementing it in context was a big step forward for our staff. Traditionally Professional Development occurred before the school year, so any learning was out of context. This year with our inquiry structure teachers were able to reflect about their students and classroom and apply their learning. ASSESSMENT PROCESS & TOOLS – Did it work? What did you learn or discover on your journey? It is an ever-changing process and challenges/failures are an important part of the learning. Collaborating and the rich conversations with colleagues have been very valuable and enriching. What changes have you made in your thinking and practice? I realized the benefit of challenging myself to try new things and the importance of persevering when I struggle. What frustrations did you face? Would this kind of Professional Development be of interest to you again? Why? REFLECTIONS: What did we learn? How did it make a difference? Reflecting on the results of the questionnaire it is obvious that we learned a lot and it made a big difference. Based on the responses from teachers, they appreciated the support and collaboration time with their colleagues. The structure of the process kept them on topic throughout the year, and teachers appreciated the depth of learning that Inquiry provided. Learning in context cannot be understated, when teachers are working through problems, they are doing so with their classroom and students in mind. Ultimately, it is their classroom and students that benefit. The fact that our staff was unanimously in favour of pursuing inquiry again speaks to the power of the process. Finding a sustainable, cost-effective and engaging mode of professional development may have been the best outcome of the process. FUTURE PLANNING: Where do we go from here? Next year I would like to continue with school wide inquiry with a few differences. The professional development calendar is changing, so I would like to offer an inquiry on the 5 full days we have. Based on the fact that the number one frustration with the process was time, I am excited by this prospect as it allows us more time to focus on the “construct” portion of inquiry. It also allows more time for groups to collaborate and work together. I would also like to narrow the focus of our inquiry. Instead of focusing on the process, I will ask people to focus on structures and strategies that promote self-regulation in our students. My hope is that many teacher will see value in that question and choose to pursue it as well. Self-regulation is an area that a number of students struggle with and there is a significant amount of research that indicates that students who struggle in this realm are at risk for developing mental health issues and not completing school. I would love to hear people’s thoughts on our process and learning. Whoa whoa whoa – stop the clock! you mean you’re not just focusing on the 3Rs? LOVE the shift to metacognitioning about learning!! This is exactly the type of process that leads to sustainable change and improves outcomes for students. It is difficult work, but all change is difficult. I was particularly interested in the fact that your staff feels even more time is needed to be able to drill deeper. I hope your experience is noticed by other schools. I firmly believe that embedded collaborative planning time is critical to moving us along the achievement agenda. Please pass on my thoughts to your staff and congratulate them on taking on this challenge.